The holidays always bring about tons of fun parties, and these cleaning tips for holiday event prep will make it so much easier to manage. Whether you are hosting a family dinner, or a neighborhood party doesn’t matter. These tips will make sure you have everything in order to provide your guests with a comfortable and clean place to celebrate the holidays. Use an essential oil diffuser for holiday scents throughout your home. Instead of burning candles or using air freshener sprays or outlet plug in liquids, we recommend using an essential oil diffuser instead. Not only will the scent go farther, they are much safer for your family. Holiday scents like cinnamon, ginger, clove, orange and similar are great for creating that smell of fresh baked foods you want in your home. Essential oil diffusers give you the chance to customize the scent blend, and they are easy to plug in and let diffuse for hours before and during your party or event. Declutter with help from the kids. 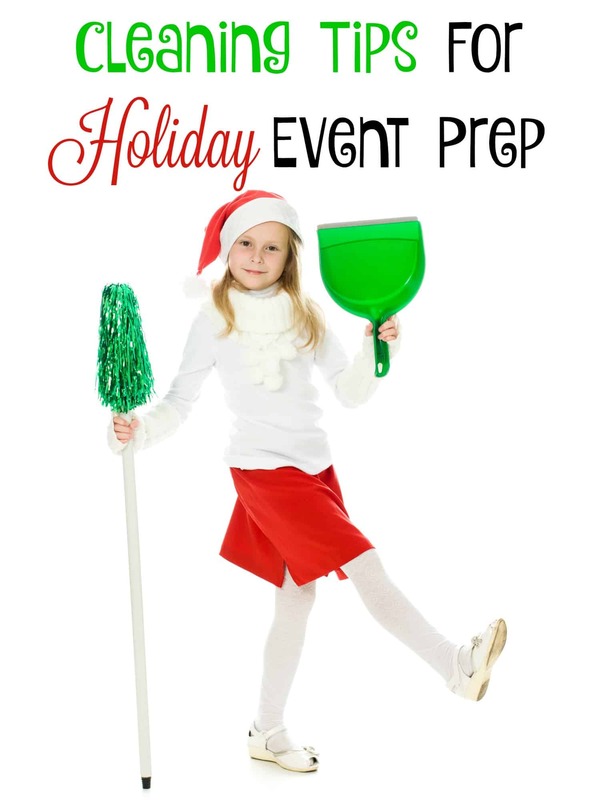 Getting the kids involved is a must when it comes to these cleaning tips for holiday event prep. From their own toys and junk that may be laying around, to things like magazines, games or breakable items on display your kids can help you declutter easily. Give them each a bag or tub to toss items into as they work their way through the main areas of your home. You can also add a bag to each room for trash, one for items to be put back in their proper place, or items that may belong in the room on a regular basis but should be moved for your event. When hosting guests, you may want to move things like your collectible items off lower shelves so there are no chances of them being broken, or just your magazine collection or throw blankets and pillows. Some things can be set aside in a kids bedroom until after the event. Consider this as you have your kids help you declutter. Move furniture to create the illusion of a larger room. For a holiday event, you typically won’t be watching television or playing video games. This is a time where the layout of your living area can change drastically to make sure you have plenty of seating, or even room for a buffet table of food. Take the time to move furniture as needed, and also to clean up around the furniture with extra vacuuming or dusting to make the room look pulled together. While you may not have enough time to actually clean your carpets, you can grab some great carpet freshening products to not only clean stains in a few minutes, but also to help with any lingering odors. A quick carpet powder or spray to help freshen your carpet can make a huge difference in not only how a room smells, but also how the carpet feels. This carpet freshener has my favorite smell of all time! Do a deep clean in the bathroom. If you are going to have limited time to prepare for a holiday event, this is the ultimate in cleaning tips. A clean bathroom can make a world of difference. A good deep clean with counters being wiped down, mirrors scrubbed, toilets cleaned and clutter moved off of counters makes your guests feel like your home is cleaner than it may actually be. This is one place to always make sure you focus since other areas of the house won’t be scrutinized as much. Add an oil diffuser to the bathroom with a fresh holiday scent or even a simple citrus scent for an even better appearance. These cleaning tips for holiday event prep will make your limited time to clean work to your benefit. Hosting a fun family event, neighborhood party or even just having your best friends come over for dinner can all be fun and stressful when you feel limited on time. These cleaning tips will make your holiday event a wonderful success. By Jennifer on December 1, 2015 Cleaning, Frugal Living, Trending Topics.